"We are a peaceful people who reject violence on principle. I pray you will see this as our greatest strength, not our weakness." Seven Years in Tibet is a film of epic proportions executed with serene subtlety. This true story follows the journeys of Heinrich Harrer (Brad Pitt), an Austrian mountain climber with an arrogant determination for success. Though his life has been greatly fictionalized, Becky Johnston's script admirably tells a compelling tale of Heinrich's emotional and spiritual awakening. The story begins in 1939, when Heinrich abandons his pregnant wife to lead a dangerous Himalayan expedition. Beginning his voyage shortly before the dawn of World War II, Heinrich and his team are soon arrested and enslaved as prisoners of war. After Heinrich and fellow climber Peter Aufschnaiter (David Thewlis) escape their captors, they set out on a long and perilous journey that leads them through India to Tibet, where the holy people of Lhasa welcome them. It is here where Heinrich forms an uncommon bond with the young Dalai Lama, a relationship that soon leads him to embrace the spiritual humilities of the Tibetan people. During its theatrical run, many viewers found themselves completely uninterested and wearied by the subject matter presented, ungraciously referring to the film as "Seven Years in the Theater." However, the film moves with a quiet pace that I found mesmerizing. The progression of events is expertly crafted, the characters are wholly engaging, and the overall message is strong. One of the greatest pleasures of watching Tibet is to marvel at Robert Fraisse's stunning cinematography, his 2.35:1 compositions consistently leaping off the screen with panoramic splendor. Despite a somewhat inconsistent Austrian accent, Brad Pitt delivers a wonderfully complex performance as Heinrich Harrer. It is nothing less than engrossing to witness him slowly transform from a conceited Nazi sympathizer to a peaceable confidante of Kundun. The real standout, however, is child actor Jamyang Jamtsho Wangchuk, who plays the fourteen-year-old Dalai Lama. His simultaneous display of childlike curiosity for western culture and astute spiritual enlightenment is an engaging performance to behold. While the story is engrossing, it can be a bit muddled at times. It predominately focuses on Heinrich's journey through life and his turn from bitter arrogance to appreciation and compassion. Yet, in the third act, the film focuses more on the forceful Chinese occupation of Tibet and the Heinrich character all but fades into the background. I would have found it more interesting and sensible to keep Heinrich's presence strong within this story arch. Some could argue that the intentions are to focus more on the courage and wisdom of the young Dalai Lama at this point, but his presence comes far too late in the film to be considered the protagonist. Nevertheless, in spite of a few missteps, Seven Years in Tibet is a captivating cinematic experience. Casual moviegoers may find themselves bored to tears, but cinema buffs will likely marvel in its majestic beauty. Image Transfer Review: It is quite a dilemma reviewing this image transfer, as its positive attributes are remarkable and the negative elements are a major letdown for the Superbit format. During the opening moments of the film I was immediately awestruck by how colors seemed to leap off the screen. Furthermore, the level of detail is outstanding; even when shot from a distance I could distinctly notice the fine woven threads within the monk's beautiful costumes. What disturbs me is the level of compression artifacts, which are apparent on far too many occasions. It is my understanding that Superbit boasts a higher bitrate, thus less compression, so, what went wrong here? Edge enhancement also often weakens the film-like quality of the image. These artifacts are not enough to diminish the pleasure of watching the film, but I would certainly consider this image transfer to be genuinely flawed. Audio Transfer Review: A strange choice for Superbit treatment, the 5.1 soundtracks are fairly front heavy and subdued. While the film is very quiescent and mostly resides in the center channel, overall fidelity is exceptional with dialogue that is clear and distortion free. The surround and LFE channels are used minimally, yet their presence is impressive and bold when engaged. Both the Dolby Digital 5.1 and DTS soundtracks are virtually identical, with the slight edge going to DTS for more refined low end. While not a particularly thrilling soundtrack, this is an admirable complement to the film. 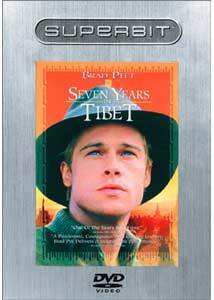 Extras Review: Yet another standard Superbit release, Seven Years in Tibet is completely void of special features. This common Superbit practice is to allow more disc space for a better image transfer, but I found the results here to be marginal. Seven Years in Tibet is a quiet and pensive film filled with breathtaking images and first-rate performances. While the film is highly recommended, the Superbit version does not live up to its high standards, and Superbit supporters may find themselves disappointed by the mediocrity of this release.